Download Web Security Dojo from https://websecuritydojo.sourceforge.io . To install Dojo you first install and run VirtualBox 5 or later, then “Import Appliance” using the Dojo’s OVF file. We have PDF or YouTube for instructions for Virtualbox. The OVA should also be able to be imported and used in various VMware tools, but we do not support this directly at this time. Sponsored by Maven Security Consulting Inc (performing web app security testing & training since 2001). Also, could be you! 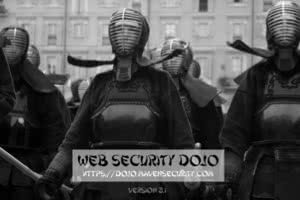 Web Security Dojo is an open source and fully transparent project, with public build scripts and bug trackers on Sourceforge .